Do you have a home to sell in the Tampa Bay area? Selling a home on your own can be a challenge. Just as buying a home is a process, selling your home is also a process. A REALTOR® should bring value to the process and help you sell your home quickly. 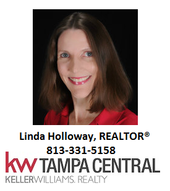 As a REALTOR® in the Tampa Bay area, I want this process to go as smoothly as possible for you. Once you have decided to hire a REALTOR® or real estate agent to sell your home, it is important to choose the right person for the job. This decision can make all the difference. When we first meet to discuss selling your home, I will describe the benefits I can provide during the process. If we agree that I am the right REALTOR® for the job, I will be ready to go to work immediately to sell your home. As I market your home, buyers will begin to look at your home. When offers come in, I will work with you to negotiate the best price for your home. Once an offer has been agreed upon and signed, I will cooperate with the buyer's agent to help the process go smoothly through the closing. Congratulations will be in order for successfully selling your home! Selling a home can be an emotional experience. I would appreciate the opportunity to talk with you about the value I can provide during the process of selling your home.